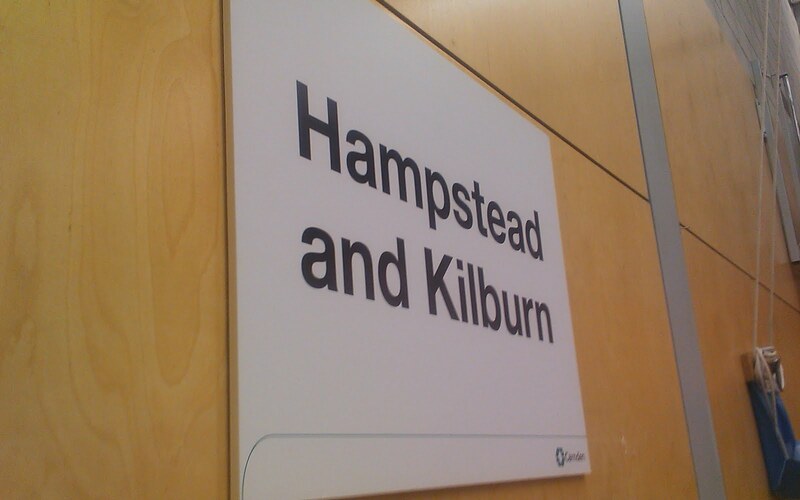 The early indications when I arrived at the Hampstead & Kilburn count were that it was going to be close. It was too soon to tell quite how close. 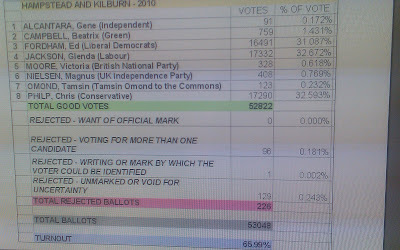 180 counters split between H&K and Holborn & St Pancras first had to verify the ballot papers. This means checking that the number of votes in the ballot box is the same as the number of votes that is supposed to be in the ballot box. As they do this, dozens and dozens of party supporters, candidates, council candidates, campaign teams and number crunchers – hover over them like hawks trying to keep track of how their candidates are tallying up. It looks complicated (and slightly intimidating). Pages of tallies are then fed to the geeks who presumably make extrapolations, predictions and prognostications, which seem completely pointless given that the actual result is only a matter of hours away. There were some inevitable problems with the redrawn boundaries. Some ballot boxes had to come over from the Brent wards that now form part of the new constituency. 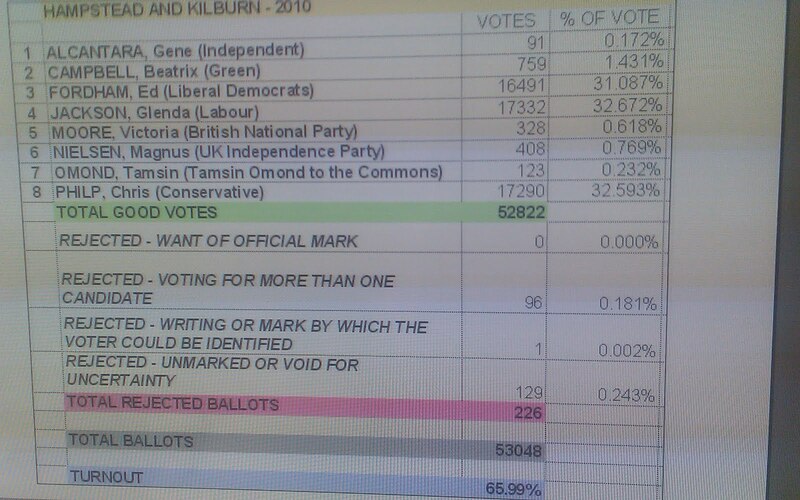 Of course with two voting papers, people make mistakes and put parliamentary ballots into the council ballot box. These papers also had to be dispatched to Haverstock school and were one of the causes of the lengthy delay in the first count being finished. 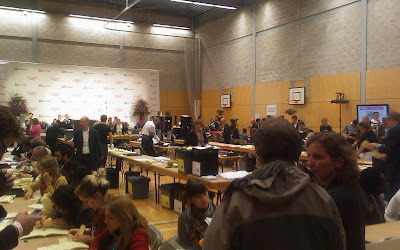 During lulls in counting (for example while waiting for the Brent boxes), the rosette-wearing phalanxes descended into the refreshment area where the media was largely camped out along with some Camden staff. The groups coalesced into pockets of red, blue, yellow and green, all grouped around the TVs. Every time Labour held a seat a roar went up from the red corner. Whenever the Conseratives gained a seat a similarly man-sized cheer erupted. There weren’t very many cheers from the yellow camp. Any sense that Ed Fordham might romp to victory in Hampstead & Kilburn, therby justifying the exceedingly short odds available on him, was clearly evaporating. “It’s very close” was the anxious utterance from all sides. As the count neared its conclusion, the ballots for each candidate were bundled together in groups of 25, topped with an appropriately coloured piece of paper, and placed together in long rows. In even ‘quite close’ races, this makes it reasonably easy to see the state of play. Who’s got the longest set of bundles should be easy to judge by eye. Frank Dobson’s victory over Jo Shaw in the Holborn & St Pancras seat was evident well before anyone clambered on stage. In the H&K counting hall, however, the blue pile was opposite the red pile and they looked to be exactly the same length. The yellow pile was next to the blue pile and although it was hard to be sure, it did look marginally smaller. 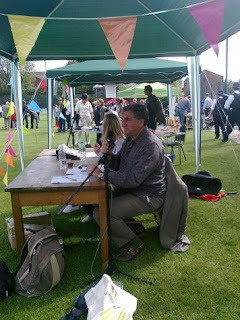 Confined to the media zone though it was hard to get a clear picture. 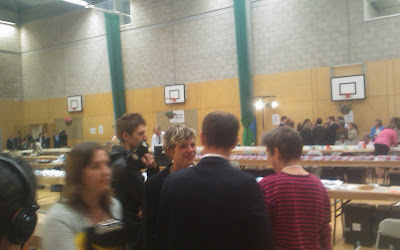 Tamsin Omond claimed she’d seen a pile of votes for her, relieved that she’d at least made double figures, but it seemed very clear that this was a three-horse race (who’d have thought?) and the other candidates were not going to figure in any meaningful way. Talk of a recount had been floating around for some hours. Ed told me that he would leave any such decision to his agent, but that a gap of around 500 might be worth a second look. Chris – whose emotions normally seem to be held in check – had quite an animated conversation with me, expressing a lack of comprehension as to how on earth Glenda’s vote was holding up so well. Some time later, as we all waited for news, he blasted through from the counting hall, urgently looking for somewhere private to talk to his wife. With a face like thunder, one might have expected the worst, but a glance at the votes suggested that he was right in the mix. The final Brent votes arrived. It looked as if Ed Fordham was out of the race now, unless.., unless there was a significant number of these “loose” ballots. Chris was unlikely to pick up many votes from Brent, so could this be Ed’s chance to catch up. The report was that the pile of new ballots was slim, and thus so were Ed’s chances of living up to the pre-election hype. The faces of the yellow rosettes were struggling to muster smiles. We were down to two. Sky’s journalist Orla Chennaoui, who had been hanging around with her camera crew since well before the count started, scooted over with an eavesdropped tip – just 50 seats split Chris and Glenda. A recount was inevitable. Tamsin came over with a printout of the actual figures. It really was tight, Glenda’s lead was closer to 70 than 50, and Ed Fordham was less than 1,000 behind Glenda too. The others were all a long way back with the Green’s Bea Campbell comfortably in fourth. A 15 minute break was called before the recount, and we all took the opportunity to refuel. Then the counters filed back into the hall and off we went. 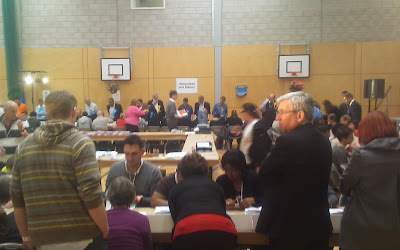 It seemed that every counter was being scrutinised by two or three campaigners. Chris stalked around the outskirts, looking in at some counters. Everyone was exhausted, so who knows how they were able to concentrate. Ed knew he was beaten, but found time for some supportive words for Tamsin who deep down must have hoped to do better than her 123 votes. “You ask the questions and there are only two answers”, he said philosophically. I guess you can’t go into politics if you’re not prepared for losing. There was a small whoop and cheer from a corps of red rosettes. Game over? Chris walked past. “How are you feeling?”, “Yeah, I’m fine.” It seemed there would be no second recount. The candidates took to the stage – well, some of them did. Gene Alcantara, the BNP’s Victoria Moore and, more surprisingly Bea Campbell didn’t appear. Personally I think that it’s a disservice to the people that bothered to vote for you not to turn up to the result. Glenda was grinning widely amid cheers. The returning officer read out the votes starting with Alcantara’s 91 and finishing with Chris Philp’s 17,290. The crowds cheered “Glen-da, Glen-da”. She had won by 42 votes. It was approaching 9am. Glenda stepped forward to give her thank yous. There was a defiance amid the usual winning humility. She singled out Chris, praising his clean campaign. No mention of Ed who had played more on her residency in Lewisham and lack of activity. The Lib Dems might have a different perspective on the Conservative campaign, after an intense spell of “Vote Fordham get Gordon” literature. Glenda talked of her pride in being the first MP for the new constituency of Hampstead & Kilburn and reiterated that she’d work hard for all residents of this area. Elsewhere, there were mutterings that she’d somehow achieved this Houdini act on the back of a couple of leaflets and some hustings performances. Apparently a Tory press officer had admitted earlier that they had expected Ed to take the seat, but the forest of literature pushed through our doors and into our hands by the Lib Dems and the Tories had ultimately been for nothing. Chris stepped forward and was very gracious in defeat, although didn’t congratulate Ed for his strong showing. Ed paid generous and warm tribute to Glenda,and thanked his campaign team amid cheers. Some people may even have had something in their eye. Ed – just 841 votes behind Glenda – said that the independent spirit would live on in NW London. Nationally, it had been a night when the Conservatives good cheer was slightly muted and the Lib Dems had looked shocked from the moment the exit poll came out. Locally, it seemed that the scare tactics and jockeying for position as the true rivals to Labour had ended up splitting the anti-Labour vote. The night was now the day. It was over, and it belonged to Glenda Jackson.